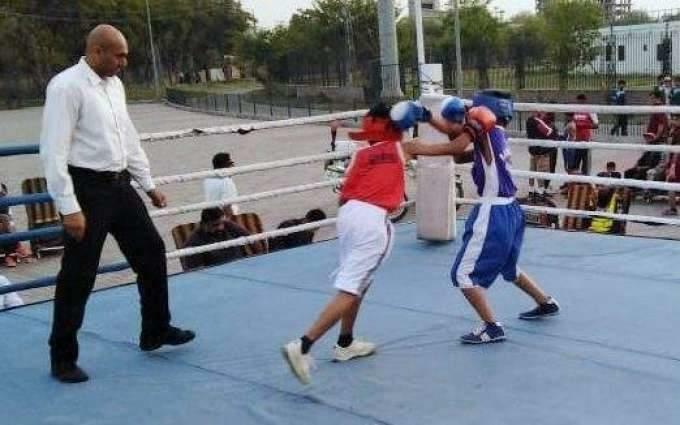 LAHORE, (UrduPoint / Pakistan Point News - APP - 16th Apr, 2019 ) :Lahore under-16 team claiming 102 points, emerged winner in Annual sports Calendar second phase boxing event at Nishtar Park Sports Complex here Tuesday. The second position went to Gujranwala, who scored 53 points followed by Sargodha (52 points), Faisalabad (43), Multan (37), Bahawalpur (27), Rawalpindi (22), Sahiwal (18) and DG Khan 6 points. In Annual Sports Calendar second phase girls cricket event, Lahore girls defeated Sahiwal by a huge margin of nine wickets in an important match played at Lahore College for Women University ground. Sahiwal girls scored 44 runs for the loss of three wickets while playing first in the allotted overs. Aqsa and Anam remained top scorers with 19 and 18 runs respectively. Halima Dua of Lahore grabbed one wicket while two Sahiwal players were dismissed run out. In reply, Lahore chased the target after losing just one wicket 4.2 overs. Halima Dua also showed her glorious batting form scoring 30 runs with the help of five boundaries. TayyabaZulfiqar contributed 10 runs. KinzaNadeem took the only fallen wicket for Sahiwal. In another match, Faisalabad defeated Multan division by 25 runs. Sargodha girls remained triumphant by nine wickets against Gujranwala in the third match at the same venue. In Annual Sports Calendar second phase boys' cricket event, Sahiwal trounced Gujranwala by 26 runs at Punjab University New Campus ground. Sahiwal scored 70 runs while playing first. In reply, Gujranwala bundled out for 44 and lost the match by 26 runs. In Annual Sports Calendar second phase kabaddi event, Sargodha stunned Lahore by 19 points in a crucial match played at Punjab Stadium. Sargodha under-16 players exhibited wonderful performance right from the beginning and gathered 41 points as compared to 22 by Lahore. Faisalabad defeated Multan by 22 points in a Group B match. Faisalabad players demonstrated excellent performance in both raiding and stopping departments and scored 35 points while Multan players could accumulate only 13 points. Sahiwal overwhelmed DG Khan by 12 points in the third match of the day. Sahiwal scored 31 points in comparison to DG Khan's 19. Meanwhile, Director General Sports Punjab Nadeem Sarwar has congratulated Lahore under-16 boxing team on taking first position in a 9-division competition. He also lauded the performance of other participating teams of the event. "Sports board Punjab is organsing Annual Sports Calendar competitions to encourage talented male and female players of the province," he added.